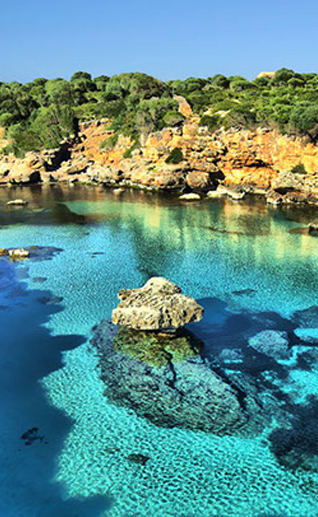 6Points Mallorca starts and ends at Caló d’en Pellicer, the small beach in Santa Ponsa, and travels to the extremities of the four compass points of Mallorca (north – Cap Formentor, south – Cap de Ses Salines, west – St Elm and east – Cala Ratjada) and to the highest (Puig Major) and lowest points (Santa Ponsa beach) on tarred roads in three days, covering over 400km and climbing over 7500m. Santa Ponsa to Saint Elm, up the spectacular Tramuntana mountain range (don’t forget to bring your climbing legs!) 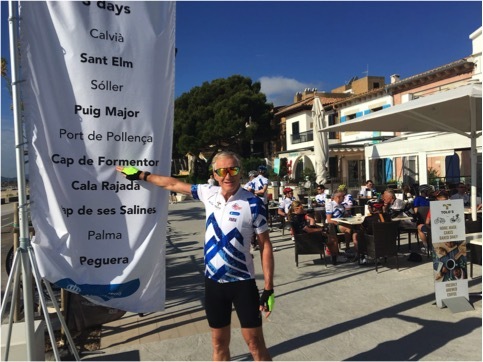 to Banyulbufar, Soller, up the 14km climb to the top of Puig Major and on to Port de Pollensa for the night. Dinner at the fantastic Tolo’s restaurant in Port de Pollensa and spend the night at a good hotel. Port de Pollensa to the beautiful Cap de Formentor, back to Pollensa and via Alcudia to Cala Ratjada and down to the picturesque Sa Coma. Dinner and overnight stay at a good hotel. Sa Coma to Ses Salines (great flat riding), Llucmajor, Palma (where we touch the sea for the lowest point) and back to Santa Ponsa for a well deserved beer! The fabulous event will come to a close with a Celebration Dinner in Santa Ponsa. Minimum donation to the event is €100 non-refundable, but transferable – which is also the registration fee for the event. In addition, please work hard to raise personal sponsorship and we trust that you will be able to raise a lot more money for Charity! This years sponsors include: Calvia Council, Tolo’s, TriGreen Cycles, Pinmar, Calvia Vet, Tip Top Blinds, Ticket, Physicool, Arash, El Toro Foods, Katie Handyside Training and all money raised goes directly to our chosen charity ‘Asdica’ The event, running for the third time is the brainchild of Brian Visser and last year 27,774€ were raised. Please note that the event donation does NOT include the cost of hotels, meals and other expenses that you may incur on the ride. It will be huge fun! 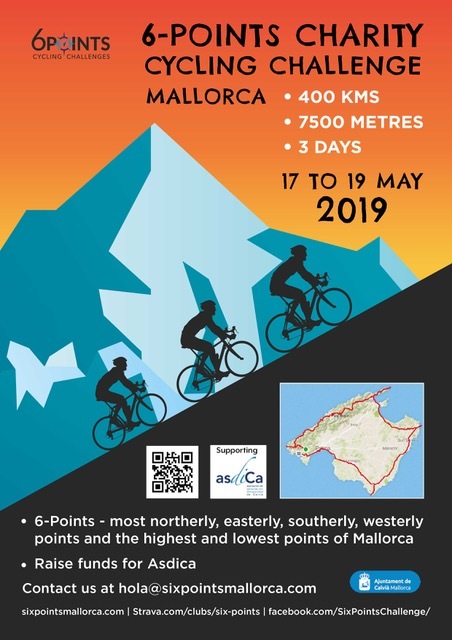 This event is excellent fun and I would encourage cyclists of all levels to enter the 312 or 167km bike, as it’s excellent training for this and will simply give you more confidence on the day. The first day is the most challenging, but riders are encouraged to ride at their own pace. It’s not a race it’s a sportiff. Get a group of your friends to come with you. It’s spread over the course of the weekend, so you get adequate rest and feeding between the stages. 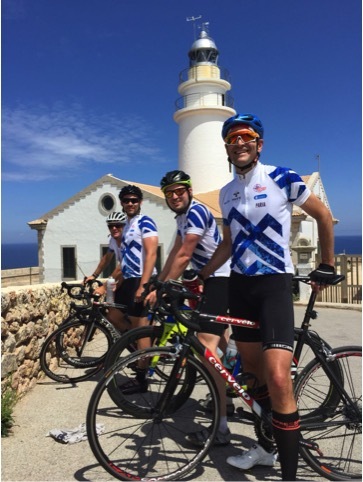 The first day is travelling down the Tramuntana from South to North, so this is when most of the climbing is done. Make sure your legs are fresh and you get an early night. There is plenty of opportunity to stop and eat and drink, but make sure you have water and optional electrolyte solution. You also carry with you any additional nutrient and calorie dense bars and food for your pockets. This is an endurance event, so make sure you build up your miles on the bicycle. You should be doing long rides at the weekend and some interval training sessions during the week. Your base miles or base training should be long aerobic rides and your interval training – hill sprints. Then there is nothing else but to cover the west coast. With all this under your belt you will find the event an enjoyable breeze. Do not neglect your weight training and stretching. Power exercises for your legs, core exercises for a stable body, protection of the back and adequate stretching for your gluts, quads, hamstrings, calves and back.